I am not the first person to review The Hunger Games, nor will I be the last. I always feel a little silly reviewing books that have already gotten so much hype in blogosphere. Really, what can I add that hasn't already been said? 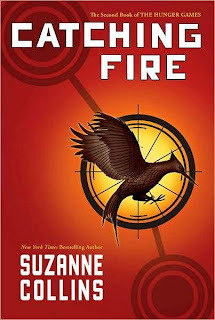 So I am going to skip plot summaries for both The Hunger Games and its sequel Catching Fire because... well, mainly because I'm feeling pretty lazy, and anyway, I'm sure you've all heard/read them before. When I first started reading The Hunger Games, I was immediately reminded of Shirley Jackson's short story "The Lottery." I think if you've read both, you probably caught this, too. I was so much reminded of it, in fact, that I thought maybe Suzanne Collins was doing some sort of writing exercise, taking another author's idea and twisting it and changing it and morphing it into your own. The Hunger Games starts off with such a deliciously disturbing atmosphere. Something is wrong, but you can't quite put your finger on it. And then, BAM! All of a sudden, you are hit with all that is wrong and it just keeps growing throughout the entire book. I could not put The Hunger Games down. I read it in a day and then immediately demanded that my friend who lent me the book meet me ASAP so that I could get the sequel from her. Catching Fire came out about a year after The Hunger Games did, so for people who did not read the one book immediately after the other, it probably was better. However, coming immediately after The Hunger Games, Catching Fire failed to er, catch fire for me (sorry- pun TOTALLY intended). Much of the first hundred pages sounded more like a summary than a story. 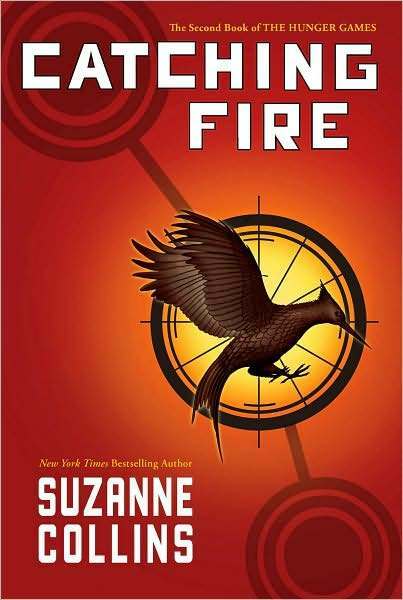 After the intense first-person narrative of The Hunger Games, this was really disappointing. I also thought there was a lot of stuff rehashed in Catching Fire that was already done in The Hunger Games, and that was kind of upsetting, too. I must say, in reading Catching Fire, I was reading it to finish it, not in a grip of excitement to find out what happened next. Mostly, this disappointment was due to the famed "love triangle." I don't know if one can even call it a love triangle as one side (Gale) has nearly no role in either book. He shows up, says a few words, and then Katniss dissolves into memories of him, but the poor guy can't make much of an impression on his audience, especially when The Other Man (Peeta) is front and center ALL THE TIME. But somehow, he's still a side in this love triangle, with Katniss, the girl who doesn't want to get married or be in love but somehow manages to have two highly attractive men fall in love with her, in the middle. This sort of plot device always annoys me, and I get even more annoyed when I feel it is being unnecessarily strung out over three books. Katniss went from being a decisive, quick-acting and practical character in the first book to being a very emotional and, dare I say it, whiny teenager in the second. In the first book, she seemed much older than her 16 years. In the second book, she definitely hit the delayed puberty drama. And I feel bad for giving the love triangle so much real estate in this quasi-review because it's so clearly not the point of the series (at least, I hope it's not). There is so much else here. Self-determination. Choice. Pride. Absolute power. Rebellion. Political machinations. Censorship. Groupthink. Reality TV. And all wrapped up in a fast-paced, action-packed package. I don't read many books set in a dystopia, but these held my interest (except for the boy drama of Catching Fire), and I definitely plan to continue with the series. Having read Hunger Games more than a year ago and still holding up for Catching Fire (I have it, but I don't want to read it until its sequel comes out), I am actually happy that CF's first pages contain a summary of what happened before, as I was actually worried I'd have no idea who's who by the time I actually got around to reading it. I cannot quite comment on the rest of the review because I've only looked at it diagonally (wanting to preserve as much of the mystery as possible), however I am quite sorry to see that CF is less than I hoped it would be (Katniss + whiny teenager = blech). 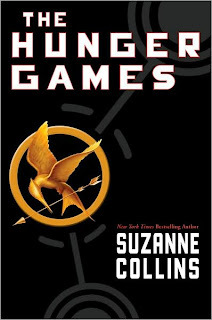 I've heard of the title but don't know anything about The Hunger Games and haven't read it. But you've made it sound so interesting. I actually confused it with an Indian book, duh! I picked up on the feel of "The Lottery" too, Aarti; I think in a way Collins was paying homage to Jackson whilst modernising the dystopia and expanding into different themes. Catching Fire was definitely weaker and in may ways a bridge book; I hope that Mockingjay is far stronger and an amazing finale to an addictive series. I really enjoyed both of these books (in some ways Catching Fire more than Hunger Games). I read them before the hype was huge, which I think helped. And, I had a few months in between reading the two, which made me not on Katniss overload. Bummer that you didn't love them! I haven't read these yet and I have to admit that I was never really interested in them, but you made them sound interesting and so they are now added to my wishlist. You know this already, but I agree with you 100% Aarti! Like Kim, I hope that Katniss ends up choosing neither guys (firmly Team Katniss here!). I do wonder if perhaps I had the same issue as you, reading the books back to back, because while I read The Hunger Games for the first time three months before CF came out, I reread it in the weeks before to make sure I was caught up and ready for the sequel. I read these before I heard all the hype, which let me enjoy them more. I agree that Katniss is weaker and more vulnerable in the second book, but I think a lot of that is because she's out of her element. In the first book she assumed she was going to die and she just did what she had to do to survive. In the second book she's suppose to be a representative and people look up to her. She's at a loss for how to act and hates her new position. Either way, I can't wait for the final book! I kind of thought of The Hunger Games as "The Lottery" meets Survivor. 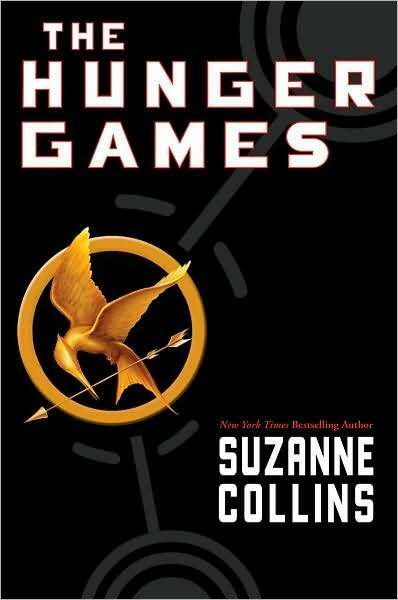 :-) Suzanne Collins once wrote that the idea for this novel began to germinate when she was flipping through T.V. channels. A "reality T.V. show" and news about the war began to mingle in her mind in interesting and disturbing ways. Kay- It's not so much a summary of what happened before as a summary of what happened for like, the first nine months after the games. But I definitely think waiting to read the second book is a good idea! Blodeuedd- Yes, it felt very similar to me as well. chasingbawa- Oh, what Indian book? I don't know any with a title like that. Paperback Reader- I knew someone did, but my search through Google Reader provided me with no proof of my memory. I hope Mockingjay is much stronger, too. Helen- I definitely think hype has a lot to do with it. For example, I didn't love Graceling as much as Fire, and I think that is because there was so much hype for Graceling. Iris- If you do read them, I will be very interested in hearing your thoughts! Kim- I am hoping the very same thing. I am exhausted by her melodrama! Amanda- I think that probably had a lot to do with it for me, though my friend read them back to back, too, and enjoyed them both a lot, so I don't know if it's just us. rhapsody- Oh, I never considered that! Maybe it was Collins making it into a far bigger deal than she originally intended due to rabid fans ;-) I think it got too much for me. Avid Reader- I don't know that I agree. She is in the same situation, really- back in the Hunger Games- and doesn't seem to catch on until pretty late in the game that she is being looked at as a beacon of the rebellion. I get that she had a lot to go through, but it seemed much more like teenage angst than anger or disappointment with the higher powers. Stephanie- Oh, what a fun fact! I think that makes perfect sense as there is so much reality tv on! Perhaps not as much as before (is Survivor still on? ), but too much, for sure! I started reading Catching Fire and took it back to the library without finishing the first 100 pages. I was bored to death, to tell the honest truth, though I do plan to try again at some point. I'm glad I'm not the only one, though. I was beginning to think so! As I mentioned before, I have not yet read this series, though I do have it on my shelf. My kids really want me to read it, and my husband wants to do a read aloud, but I am hesitating because I am worried that it won't like up to the hype that surrounds it. I do think that I will end up reading all three books, but I can already sense that the second book might annoy me a little bit with all the boy angst. I don't know when I will get to these, but I will probably have them read in time for the release of the third and final book. I liked your review on these. It was completely honest, and I really appreciate that more than I can say. Especially in the case of these particular books! I'm really hoping that Katniss sticks with her resolution not to marry and have kids. I feel like it's so rare to see a character who does that. I found these books to be absorbing and interesting the first time through, but when I tried to reread The Hunger Games I was just not interested (alas!). So I'll read the third one but probably won't buy any of them. You're right that this book echoes "The Lottery" - it also reminds me (I liked this about it) of the legend of the Minotaur, and the tribute to Crete. I have not read either of these and if it weren't for the blogosphere, I'm not sure I ever would have come across them. They are definitely on my list though. I always enjoy dystopian books. Thanks for your reviews. I am now very anxious to at least pick up the first in the series. You're not the only one to be bothered by the love triangle. Plus in the first book, there's so much ooh-ing and aah-ing over the kissing scene. I was irate at all that, because the plot in the HG books was so captivating without having any of that romance in it. Why do YA books need to be all about love and kissing? Teens read a book only if it has romance? That was the only thing I had to complain about. Catching Fire was so much tell and not show in the first half. It was so annoying. Especially because there were several moments I wanted drawn out with dialogue and character descriptions. I'm thinking especially of the scene in the cabin, for one. Picking sides in the love triangle (if it can even be called that) seems so ridiculous because everything about romance in this world is icky. I am shocked to hear that people don't like Peeta, though, because I kind of love him. He bakes! He is cute! What's not to love there? I really don't know. I have never read The Hunger Games (or obviously the second in the series). I know, I know, I'm the last one on the face of the planet. Theoretically though, I typically find the second in a series disappointing. Andi- I am glad you felt that way, too! It's always nice to have company. Zibilee- I don't know if you would like this series, either, Heather. I feel like the same things that annoyed me would annoy you ;-) But try the first one and see what happens, maybe? Jenny- I hope she does, TOO. I would be so happy/proud of her if she did. We need some girls who just choose to be single. Brichta- I don't think I'd know them without blogosphere, either. But I felt so left out not reading them! Aths- YES, agree with everything you say! Akilah- Yes, it was very annoying. You are totally right about the cabin. I don't dislike Peeta, I just am tired of a triangle in which he is the only guy who really makes an appearance. Gale is not in it at all, but somehow causes angst, and I wish Katniss would just PICK. Or tell them both to back off. Trisha- Yes, I often find the middle book disappointing, too.
" I also thought there was a lot of stuff rehashed in Catching Fire that was already done in The Hunger Games, and that was kind of upsetting, too"
I so felt this way,and this disappointed me greatly. I am also with you about the love triangle. I don't fully get how one could choose one side or the other considering that we really have not had the opportunity to get to know Gale. I read The Hunger Games and thought it was pretty good, and then my kids read the second one and thought it was less good, and I've never gotten around to reading it. Sounds like I should wait until the third one comes out, at this point. I feel the same way about this alleged love triangle. We spend so much time with Peeta and almost none with Gale. Where's the tension? I actually enjoyed CATCHING FIRE a lot more than THE HUNGER GAMES, but I did leave a couple of months between the two. I wonder if I might have had a different reaction if I'd read them back-to-back. I was annoyed for most of Catching Fire...until I got to the end. Then I was all "I need the next book NOW!" I think I might be one of the last people on the planet to have not read either of these books! I've not read the books either. It's one of those that seem to catch my eye, but I always skip over. Might have something to do with the similarities found in the blog'osphere with Battle Royale and Hunger Games - keep thinking I should read the former first. Sorry that the second book didn't meet your expectations, but hopefully, the first book made up for it. Sounds like I enjoyed Catching Fire way more than you did. I totally see your point about Katniss and the love triangle. I think what I liked about it was the glimpse of the other districts. I'm really curious about the government and would love more to be revealed about how it came to be. I haven't read either of these books, but for the last couple of weeks I have to admit that I've been seeing The Hunger Games everywhere I go. Maybe since I've been failing at miserably at not buying books I'll pick it up. Sounds interesting. I enjoyed them both, although I was more carried away by The Hunger Games, perhaps partly because I was hesitant to start with, worried that the hype was for naught. I am itching for Mockingjay now though. What you've said echoes something I heard Hiromi Goto say at a reading though, that often books of this sort do end up seeming to be so much about a romantic interest that it overshadows the strengths of the female characters: neither her novel, Half World, nor Nnedi Okorafor's The Shadow Speaker incorporate that romantic (sub)plot, and that allows their heroines to shine more brightly and made me love them all the more. I know, I know, I constantly talk about these two novels, but they really do stand out for me!